The Days escape lite wheelchair has been around for good few years for good reason. 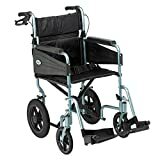 It has proved to be very reliable and well built, you could even call it a cheap wheelchair. The escape lite is available in 3 different widths and four different colours, blue, purple, red and green. As well as being lightweight, the escape lite is easy to fold which makes it ideal if you are going to be transporting the wheelchair. With a weight limit of 15.7st, this chair is not suitable for the larger user. The armrests on the days escape lite wheelchair have full length comfortable padding. These arm rests are not removable. Speaking of padding, the backrest and seat both have ample padding but as usual, we recommend an additional wheelchair cushion for added comfort. The backrest also folds in half for even better storage. The footrests of the days escape lite wheelchair are swingaway and detachable which makes it even easier to transport and store easily. They are also height adjustable and have cups on the rear of the footrest to stop the foot from slipping off backwards. The tyres are puncture-proof and are not removable without tools. Overall this is an excellent cheap wheelchair with excellent user feedback and a good list of features. Where to buy the Days Escape Lite Wheelchair?